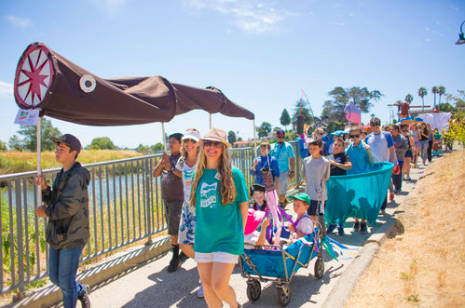 The Ebb & Flow River Arts Festival celebrates and enlivens the San Lorenzo River and the Tannery Arts Center through activities that unite arts and river enthusiasts, and connect the greater community. Through Ebb & Flow, together with artists, activists, neighbors, and strangers we’ve built relationships and energized the use of the river and the Tannery campus. Ebb & Flow is a two-day, family-friendly festival that will kick off with First Friday art making and performances on Cooper Street—followed by an evening dance party with DJ, new public art and firedancers adjacent to the Riverwalk. The revelry will resume on Saturday with a March for the River along the Riverwalk and a Festival at the Tannery Arts Center, which is located adjacent to the river. All activities are free and open to the community. Drop in for one or participate in the whole thing. 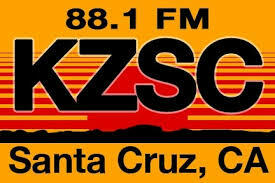 To hear our interview, press on the play button below. All events are free and all-ages. Drop in for one or join us for all. 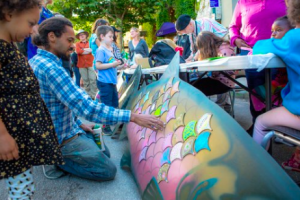 Artmaking for all ages and performances at First Friday (Cooper Street & Abbott Square). Enjoy live music and dance, booths and food in Abbott Square. We’ll have an artmaking station to make signs for Saturday’s march, and much more. Confirmed Friday performers include Blue Summit, DJ Sparkle, Samba Stilt Circus, Senderos, Iman the Clown and Post Street Rhythm Peddlers. More will be announced in mid-May. Meet at the corner of Abbott Square and Cooper Street, bring flashlights or glow sticks. Join in a procession led by the Post Street Rhythm Peddlers from Abbott Square to the Riverwalk. Experience the river at night in a whole new way. Firedancers, DJ and public art unveiling of a digital artwork titled “River Motion” on the Soquel Bridge by local multimedia artists Rachel Stoll and Aron Altmark. The artwork will be on display for one year and will respond to or depict changes in the River, including pH, Oxygen, Salinity, Turbidity, and Water Temperature. River Motion by Aron Altmark and Rachel Stoll. 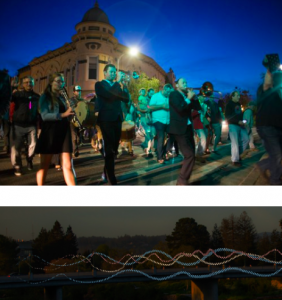 The LED neon will be on both sides of the Soquel Bridge and respond to data about the San Lorenzo River! Show your love for the river! This is an all-ages one-mile march. Participants are invited to come as they are or dress up like their favorite watershed critter. Signs, costumes are welcome but not required. Roller skates, one-wheels, skateboards and bicycles are welcome but the march will move at a walking pace. All participants please arrive at 11:45 a.m. to sign-in and so that we can line folks up. Artmaking, food trucks, and performances featuring vertical performance pioneers BANDALOOP. The Ebb & Flow River Arts Project reunites our community with the river.